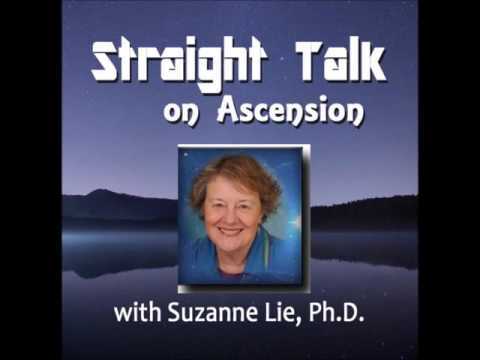 Suzanne Lie: Straight Talk on Ascension ~ Episode #5. What is Time? Today is Monday……whatever. I can’t really keep track of 3D time or places. I will be with the “time thing” for a while and then suddenly, what I now recognize as a thought form comes into my consciousness. The concept of thought forms instead of words, sounds, pictures, and other 3D visions of communication is still a bit new for many of us. Therefore, these fifth dimensional “channels of reality” that are increasingly coming online with our expanding consciousness can still easily confuse us. Just as we are beginning to understand this fifth dimensional operating system, the fifth dimensional reality channel suddenly goes off-line. Then, if we are lucky, or centered, the higher frequency reality comes back online again. Within that moment of that fifth dimensional Now, we are connected with the frequency of reality, which is just beyond our dream world, where we first learn to travel interdimensionally. It is during our interdimensional consciousness travels that we can recognize and receive interdimensional thought forms. Fortunately, we are regaining more and more of our ability to realize that these flashes of our “imagination” are indeed fifth dimensional portals of Light that we are able to perceive within that Now. Within that Now, there is no separation, no time, and no sequence because the fifth dimensional frequency of reality is beyond time/space. The fifth dimension is the next octave beyond the fourth dimensional Astral Plane, which is just beyond the third dimensional material reality. Our consciousness is expanding into the fifth dimensional Gamma Waves. Therefore, we are beginning to catch glimpses of a higher reality that does not resonate to the third or even the fourth dimension. This “Initiatory Portal” is what guides us into the first adventure of our expanded perceptions of reality. Expanding our perceptions through this “Initiatory Portal,” is a conscious passage for us to meet our fifth dimensional SELF. The word “initiation” is used because once this portal has materialized to our Multidimensional perceptions, we know we are on the cusp of a leap into a new octave of our consciousness, perceptions and experience of reality. This frequency leap is much like leaping from the edge of one cliff and on to the edge of the next cliff, which is on the other side of the void separating the two cliffs. To make this leap, we must stand on one threshold and prepare ourselves to leap across the nothingness and onto the edge of the opposite cliff. However, this is not a leap of our physical body, but a leap of our state of consciousness. In order to make this leap, we must “let go” of the first cliff (state of consciousness) to jump to the next cliff (state of consciousness). In order to LET GO into a higher frequency of consciousness, we must “let go” of our old perceptions that resonate to that frequency of reality. In this manner, we can begin to embrace the new “operating system” of the fifth dimension. We are accustomed to the operating system of the third/fourth dimension of time and space. However, as our consciousness increasingly adapts to the fifth dimension, our expanding mind can perceive that the “in-between” is not just empty space. As we adapt to our fifth dimensional perceptions, we can see, hear, touch and smell the “something” is in-between all 3D versions of separation. As we begin to naturally perceive all fourth dimensional auras, we can easily see how our auras overlap and intermingle. Hence, the male and the female blend into the “in-between” to reveal the androgynous version of humanity that was always there. However, even though we were accustomed to being on the edge of our third/fourth-dimensional self, we could not perceive the fifth dimension because our perceptions were not yet attuned to receive that frequency of reality. In order to begin our shift into our fifth dimensional Self, we need to move beyond the experience of our many third and fourth dimensional lives. In other words, we must totally release that third/fourth dimensional “edge” in order to jump across the the “in-between” and onto that fifth dimensional threshold of reality. We can best prepare for this challenge by learning the new operating system of the fifth dimension. Once, we had to crank the engine to start the car. Then we used a key to start the car. NOW we must realize that WE are the car. The “fifth dimensional system” is NOT separated into opposite polarities, like it is in the “third dimensional operating system.” Therefore, our fifth dimensional Self is NOT separated from our third dimensional self, except via our third dimensional belief in separation. It is this paradigm shift of the fifth dimensional operating system that will be very challenging to many of us. Releasing our addiction to individuality, competition, and sequence will be our ultimate test of faith. But this is not about our faith in others. This shift requires faith in our self. What will happen? We do not know. We must release all that we have become attached to in our 3D world in order to leap into a reality that we have not experienced while wearing a third dimensional Earth vessel. Those of us, and there are many more than we may think, who are beginning to remember our higher dimensional realities, our life on the ship and/or our intergalactic home-world, are getting a “preview” of where we might be going and who we might return to. As we know, it is easy to get lost the first time we take a journey. Also, this leap of faith can be much like crossing an old rope bridge that is swinging back and forth as we cross. This crossing takes great confidence within our self and within our knowingness, but at least there is something to hold onto. On the other hand, this leap of faith/consciousness is not just about crossing into a new reality. This leap is about realizing that WE ARE our Higher Self. WE are the Ascension Representatives for all of the lives that we have ever taken on third/fourth dimensional Earth. We do know from our dreams, aspirations, creativity, and deep inner reflections that we can and will make this leap of consciousness. We also know that WE are ready for this higher octave of reality. “But when will this occur?” we ask. The answer is, “This shift will occur within the NOW of the ONE.” This answer may seem impossible to our 3D consciousness. However, our consciousness is growing far beyond the confines of the Earth vessel that we are currently wearing. The third dimensional operating system is based on inner/outer, masculine/ feminine, and/or Higher Self/ego self. These titles were created to find a manner in which we could talk about the operating system for our third dimensional world. However, as we transmute beyond the concept of “separation from others,” our perceptions of separation begin to blur into the “Unity with the ONE.” It is within the NOW that we can expand into our fifth dimensional operating system. We will also discover that more and more we are leaving “time.” When we leave time, we also move beyond all conceptions of sequence, deadlines, and single moments. At first, this can be very frustrating, and even a bit frightening, as we are wonder what is “wrong” with us. However, “wrong” is a third dimensional term. And, in order to enter a reality in which every thing, every situation, and every one is Now, we must release our habit of being ruled by time. Since our “new fifth dimensional reality” has NO separation, there is NO chain of command, there is NO boss, there is NO employee. There is NO future and NO past. There is only HERE and NOW. Within the Here of the Now is Unity with ALL LIFE. Most importantly, in this new reality, there are NO conditions for Love.